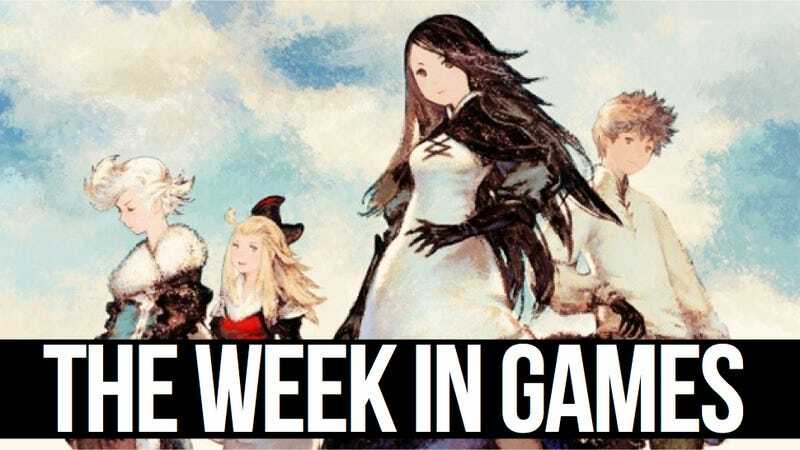 We now return to our regularly scheduled The Week in Games, now that we have enough titles to properly justify discussing an upcoming week for them. Key releases are Bravely Default on 3DS, the latest episode of The Wolf Among Us, and The LEGO Movie Video Game doing a Full Ginsburg on all eight (8) current platforms. Christ, the last time I used that phrase, there had been only five Full Ginsburgs in history. Now there are 22. Anyway, here's the week in new releases. Feb. 11: Final Fantasy XIII; Danganronpa: Trigger Happy Havoc. Feb. 18: Plants vs. Zombies: Garden Warfare. Feb. 21: Donkey Kong Country: Tropical Freeze. Feb. 25: Castlevania: Lords of Shadow; Rayman Legends; Tales of Symphonia Chronicles; Thief. Feb. 25: Professor Layton and the Azran Legacy.